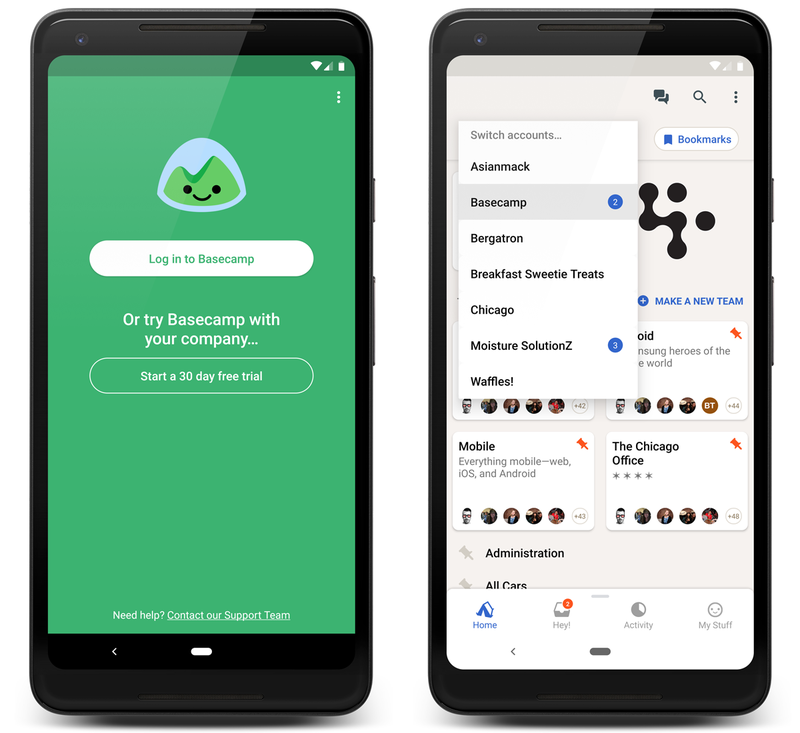 The Basecamp home screen shows your Company HQ, Teams, and Projects. Tap on a card to see all the tools available: Messages, To-dos, Campfires, and more. 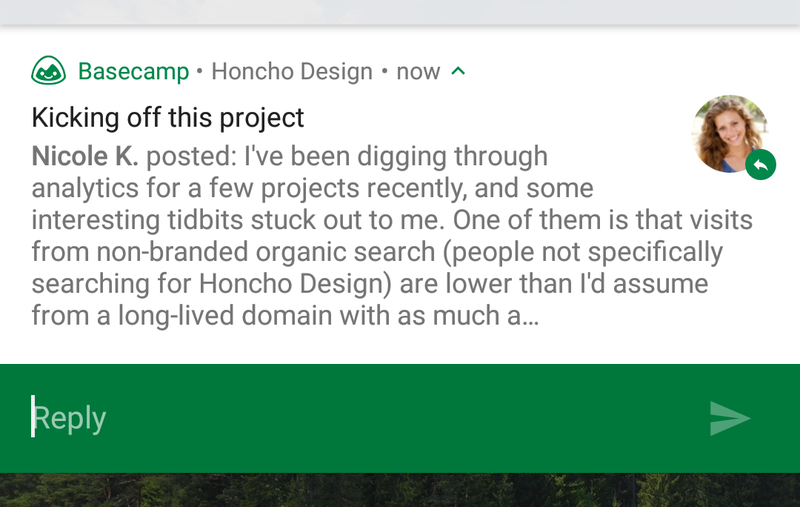 If you have a lot of Basecamp projects, tap on the Search icon in the toolbar then type the first few letters of the thing you’re looking for. You can bookmark things inside Basecamp to get quick access to them. Just tap on the Bookmarks button on the home screen to see everything you’ve bookmarked. Next to Home is Hey!. You’ll see a badge on Hey! 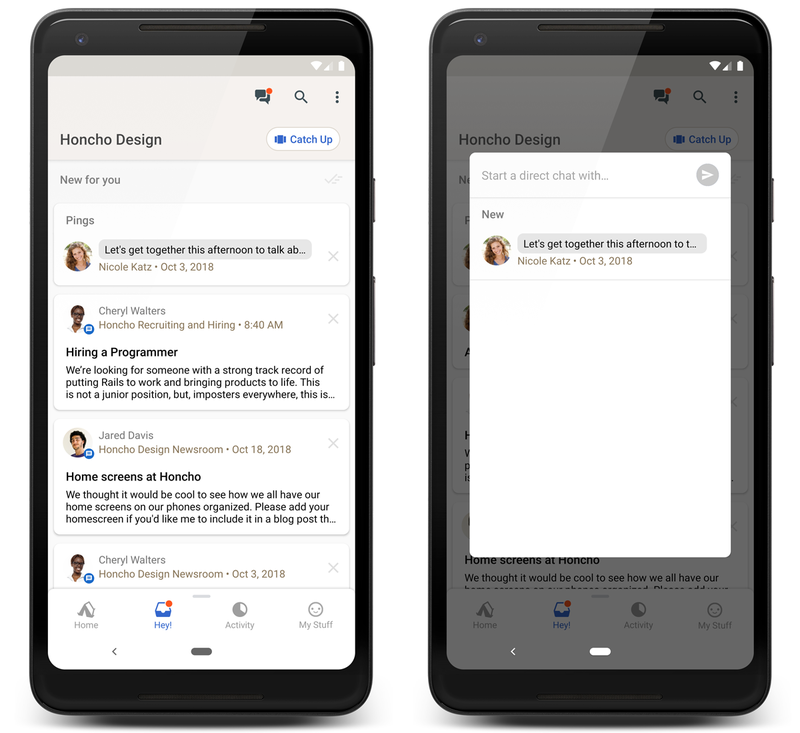 any time you have new Messages, To-dos, or Campfire notifications. You can also tap the Ping icon in the toolbar to have private conversations with others in Basecamp. You can get to Pings from almost any screen in the Basecamp app. Tap Activity next to Hey! to view the latest activity across all your projects in Basecamp. 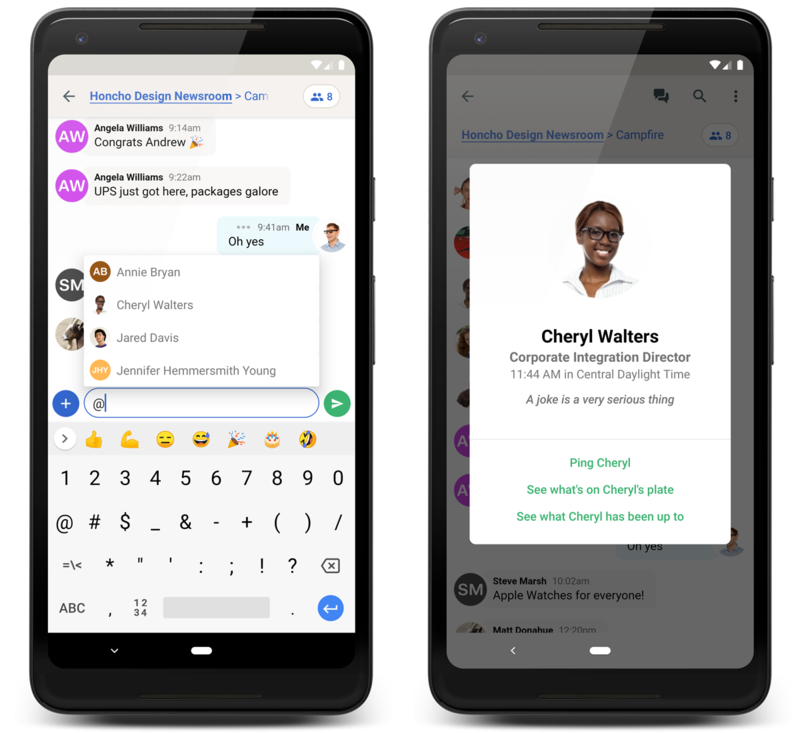 Here you’ll see all the messages, to-dos, comments, and files added even when you’re not participating in the conversations. It’s a passive way to see what's happening in Basecamp. 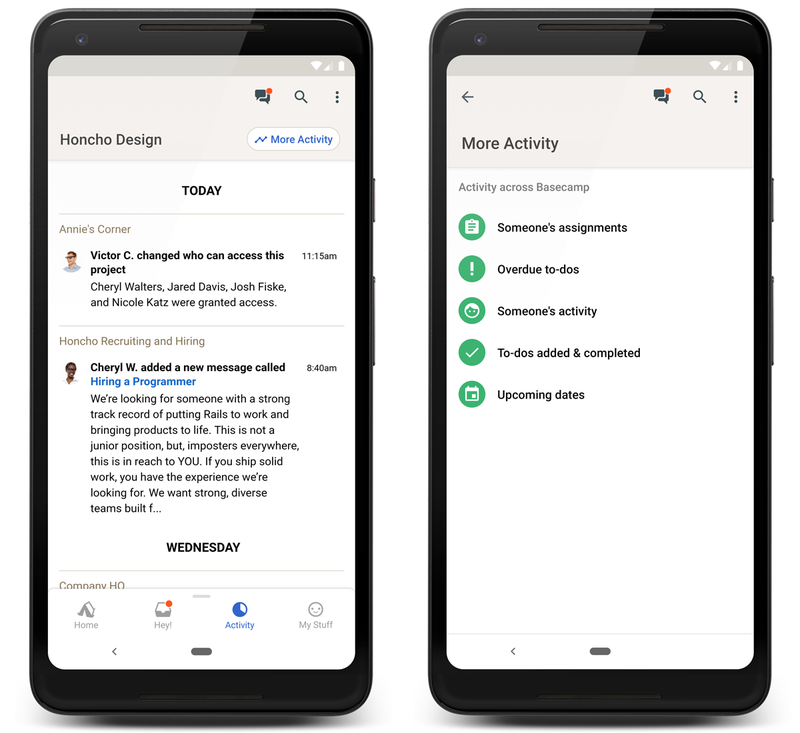 You can also look into specific activity like "Overdue to-dos" or "Upcoming dates" by tapping the “More Activity” button. 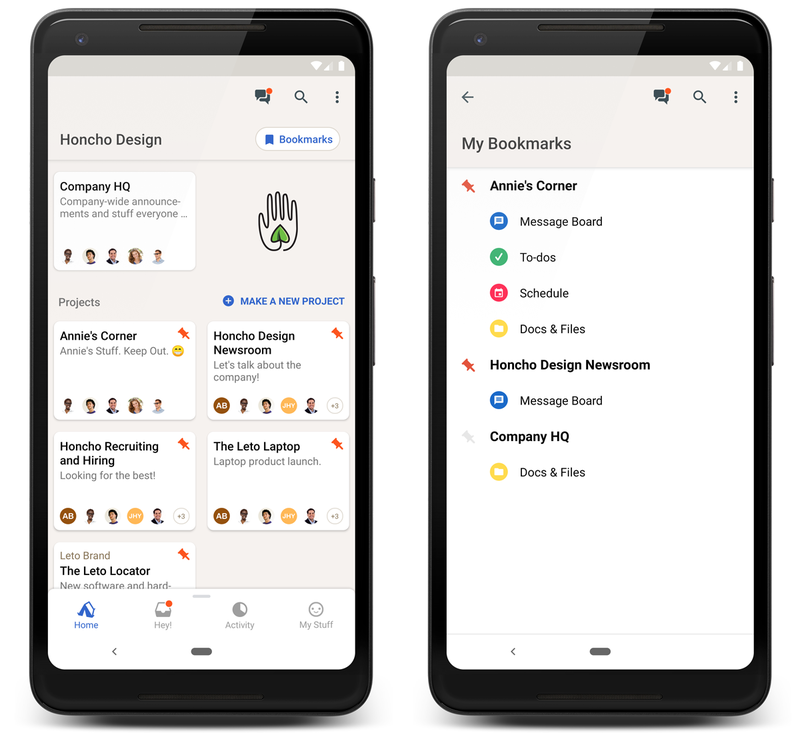 Me is where you can see your To-dos, Drafts, Bookmarks and more. 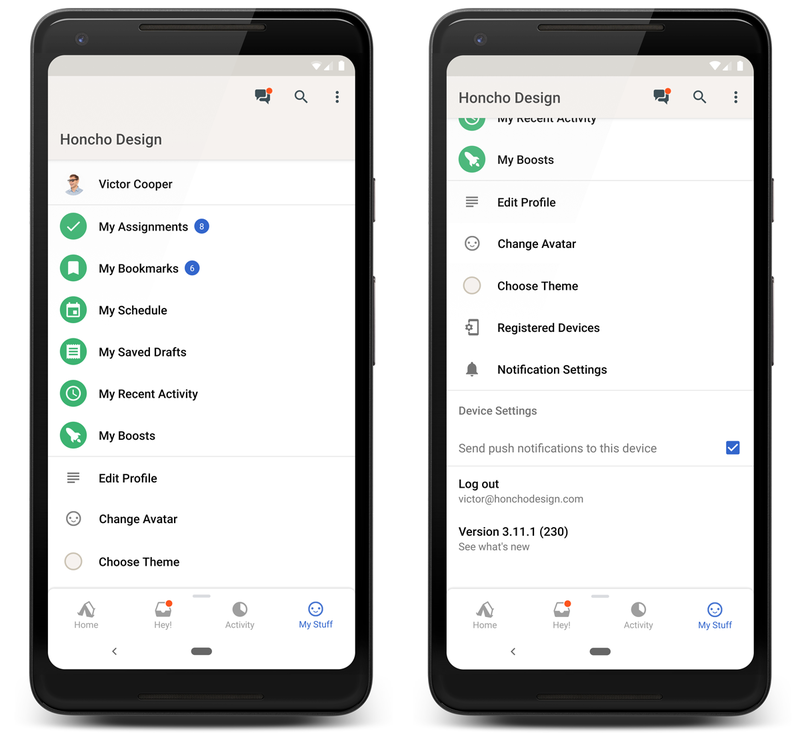 You can also update your profile, manage the devices you use with Basecamp, update your Notification and Device Settings, and log out of Basecamp. 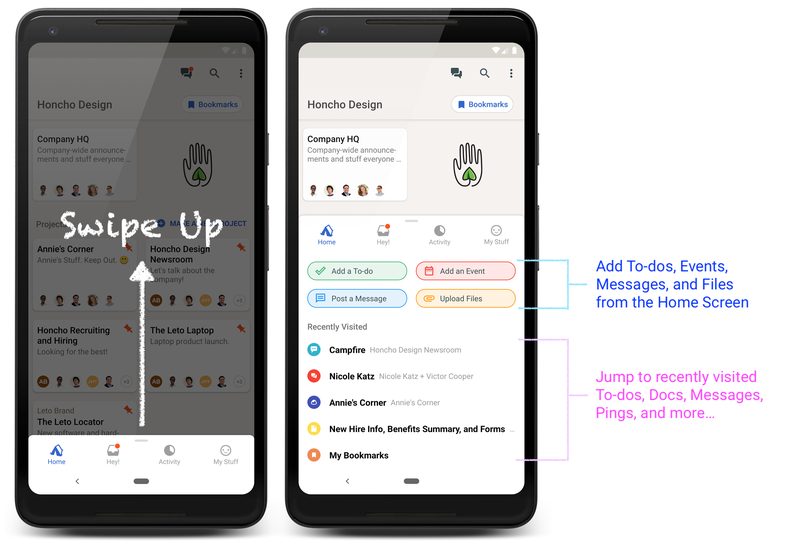 Quickly add To-dos, Events, Messages, and Files by swiping up from the bottom nav on the home screen. This will also show you areas of Basecamp you recently visited. Tap the title to get back to that screen. Note: If you don’t see a Project as an option, please make sure that the tool (To-dos, Message Board, etc) is turned on for that Project. Basecamp 3 notifies you anytime someone comments on a thread you’re part of, “@mentions” you, or Pings you. 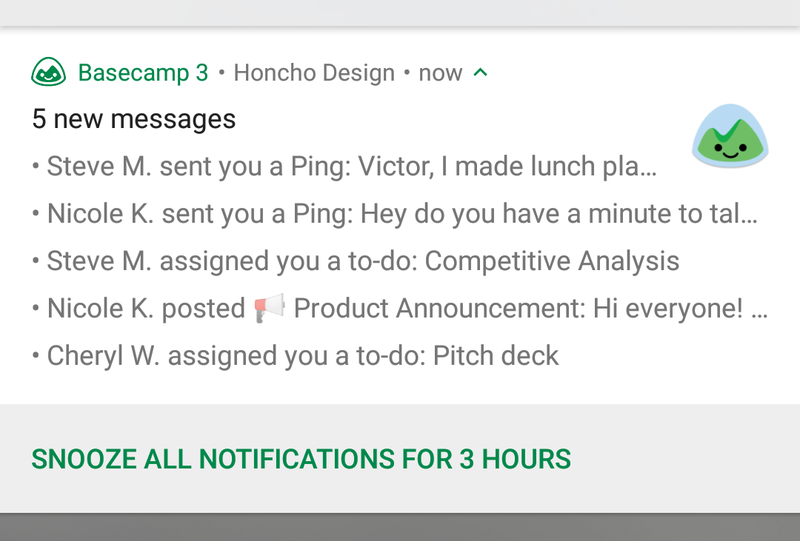 When the Basecamp 3 app is installed on your Android device, you’ll get notifications there instead of emails. You’ll be prompted to allow notifications when you first open Basecamp 3. 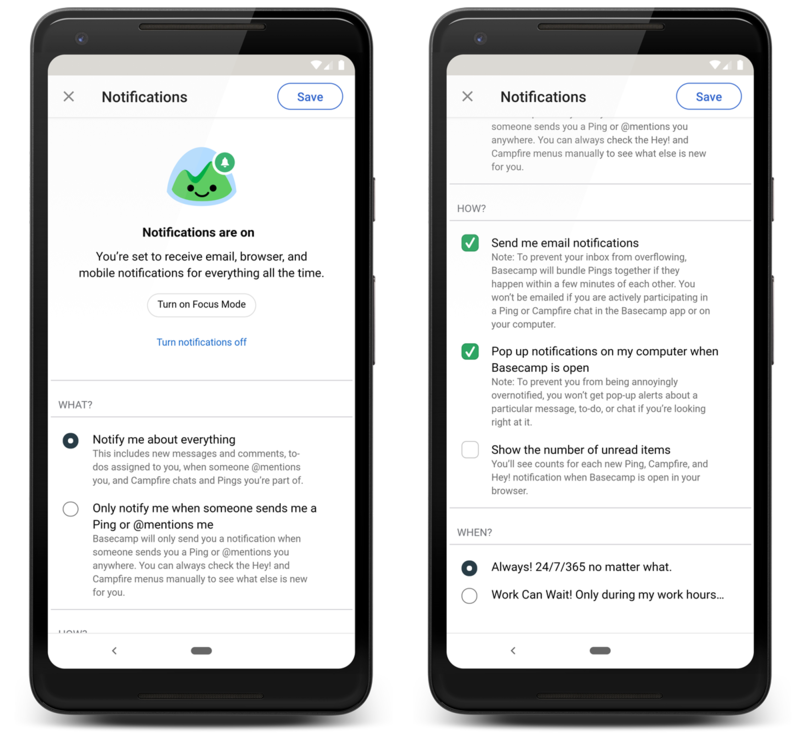 You can enable or disable notifications later in Settings. Note: You won’t get Android notifications if you have Basecamp 3 open on your desktop web browser, Mac, or Windows apps. When you get a notification you can “Mark as Read” or “Reply” without needing to open the Basecamp app. Marking a notification as “Read” tells Basecamp not to show you that message as something that’s new. If you want Basecamp to keep it unread just swipe the notification away. Basecamp 3 also allows you to snooze notifications for a few hours so you can focus. When Basecamp sends more than 3 notifications it will group all the additional notifications into one group. You can choose to snooze Basecamp notifications for 3 hours. After 3 hours, Basecamp will send out notifications based on your schedule. You can also snooze Basecamp notifications, set up a schedule to only be notified during working hours, or turn off notifications completely. Manage these settings from your Android device while on the go by tapping Me then tapping “Change my notification settings.” Work can wait! 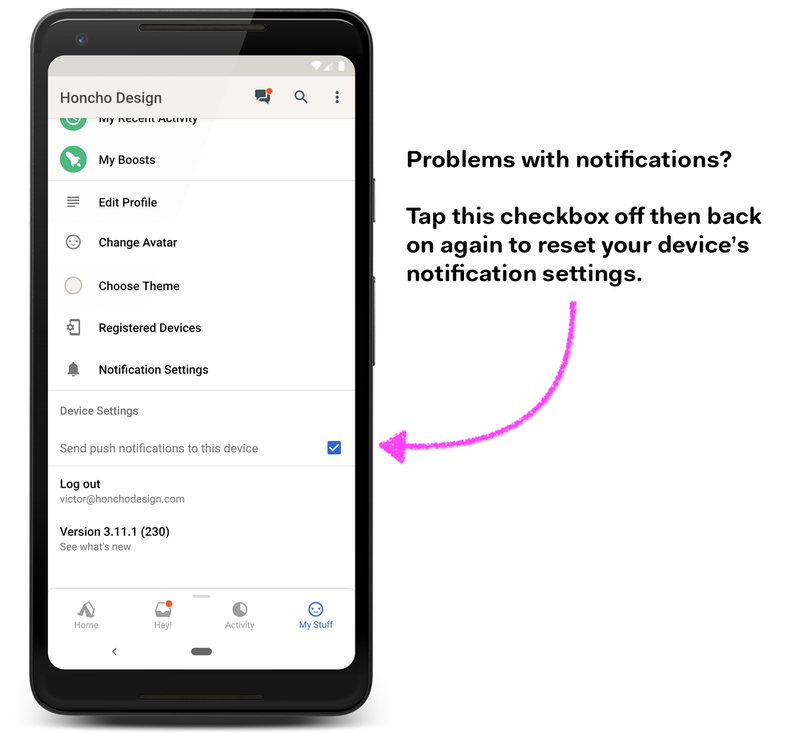 Tap into Device Settings, and then tap to turn push notifications on and off, in order to reset the notification setting for your Android. 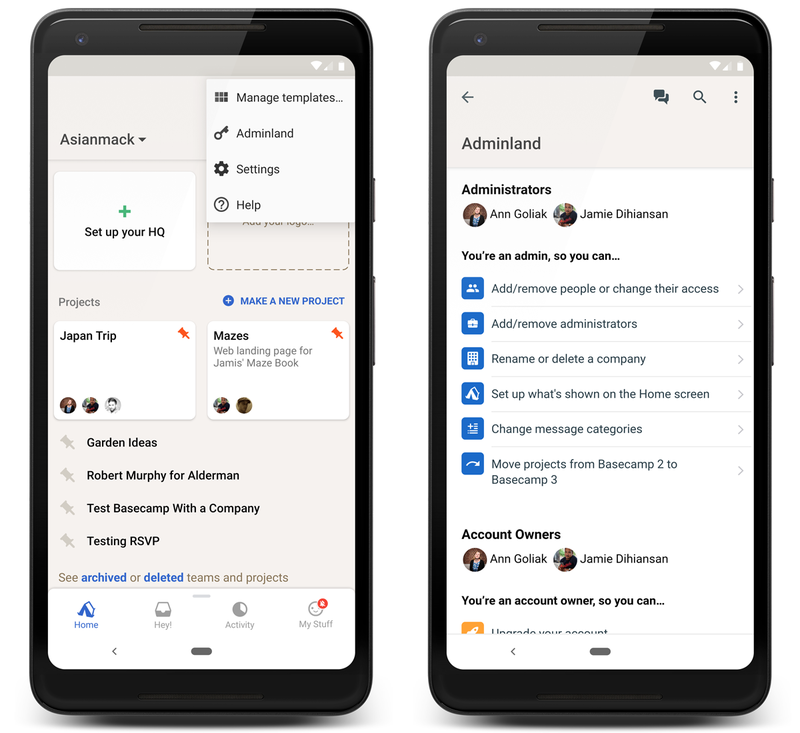 Adminland is the place to make administrative changes to your account like adding someone new, removing someone from the account, or changing which package your on. Everyone can see Adminland, but only Admins & Owners can actually make changes. Tap the overflow menu on the home screen and select Adminland. 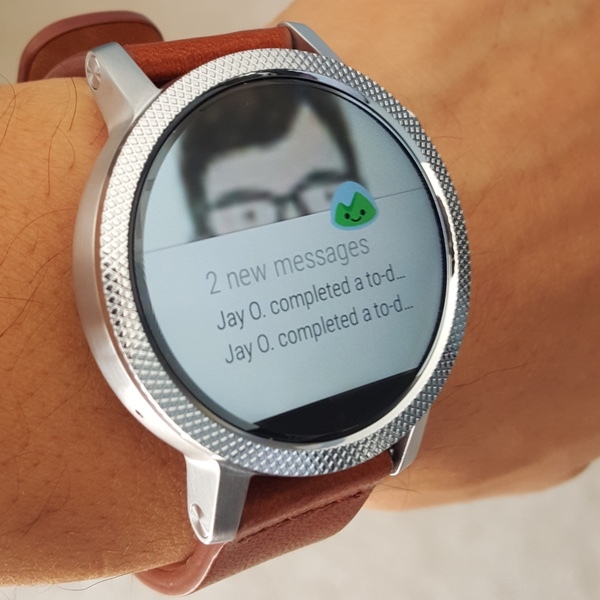 Basecamp 3 notifications are fully compatible with Android Wear devices. Currently, only notifications are supported on Android Wear; there is no Basecamp 3 for Android Wear app at this time.